Last month, we had a look at an application called Intelliberry. While it failed to make me any smarter, I did find myself accessing contacts, files and applications in an arguably smarter way. 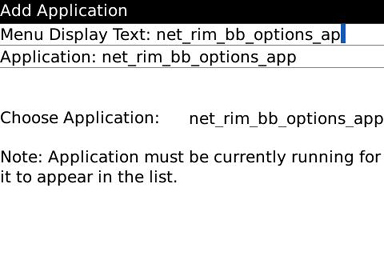 Some may disagree, but there are users and abusers out there who, despite the amazing, personalized organizational options that your BlackBerry device allows, look to be more efficient (or lazy as some have pointed out). I find this type of application beneficial, especially to the less experienced owners, who may find themselves forgetful or overwhelmed. Of course, it's always good to have options. 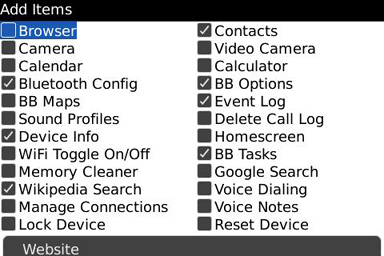 One option is BBSmart Shortcuts, which was also previously reviewed. Another option available is the aptly named QuickLaunch. The name QuickLaunch has been mentioned a few times in the blogs since the beginning of 2009, so you may not be a stranger to it. For BlackBerry Storm users, it was the first app to really be optimized to allow you to get more out of the device, and in recent months has been expanded to support non-touch device models. The application allows you to access sites, applications, contacts and more from any screen, any application, you might be on. Your convenience keys never had the opportunity to wield such power and control before. Lets read on and see why this mashup of features, including a different take on Switching Applications and Searches, has made it to the CrackBerry App Store's best seller list! QuickLaunch, brought to you by NikkiSoft, is available for the 81xx, 83xx, 8900, 9000, 9500 and 9530 (for the 81xx and 83xx series, make sure you are running OS 4.5). It's also recommended that you assign the application to either one of your convenience keys. In my opinion, the beauty of this application lies in its simplistic layout. It blends into native and third party themes flawlessly and will appear as though it is, and always has been, part of the BlackBerry OS. QuickLaunch menu appears as a popup. It's initially situated on the right side of the screen, but by changing your settings, it can be switched over to the left side. Where it differentiates itself from Intelliberry, is that it requires you to decide what you want to have access to. It doesn't learn and adapt, but it can be easily modified at anytime. When I first opened the application, the only option was to view the Device Info. 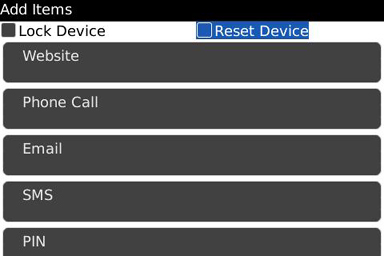 Here, I can see information such as Memory Status, PIN, IMEI, OS version, signal strength and more. Now, to see what QuickLaunch can really do, press the menu button. It is here where you can add entries (or items). The first section lets you choose shortcuts to native applications, logs, connectivity, profiles, Wikipedia/Google searches, memory cleaner, Wi-Fi options - well you get the idea. To select, simply highlight the desired item and click the trackball to put a checkmark in the box. Websites - only requires you to input the URL and Name of the site. Phone Call /SMS/Email/PIN - enter a contact method (email address, phone number, etc) or access your contact list and choose method of contact to use. No matter what method you choose, the application will auto generate the contact info into your entry. Application - You can add a third party application (i.e. Viigo, PeekaWho) to your list. Media Files - create shortcuts to your favourite songs, videos, images, etc. The items appearing in your list are not fixed to any position. 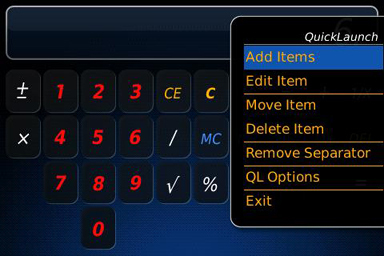 QuickLaunch allows you to rearrange your items, edit display names and add or remove separators. You can keep your contacts in one section and your media in another. For further personalization, the menu's font size and colours can be altered as well. QuickLaunch definitely opens up a world of choices, as I no longer have to decide which two apps I need to assign to my convenience keys. I can also call, email, PIN or SMS my favourite contacts directly from the application with a click of a button. The only issue I had was that I was unable to access QuickLaunch from some of the games on my BlackBerry device. 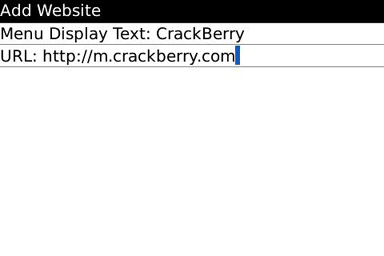 QuickLaunch could be considered a door to everything important on your BlackBerry device. In fact, it may give you better, faster access than The Keymaker (Matrix reference). As much as I love my shortcut apps, I found it easier to use than both Intelliberry (only slightly) and BBSmart Shortcuts. They all worked extremely well, but QuickLaunch sported a better UI. I would like to see some of the same adaptability as we do with Intelliberry. 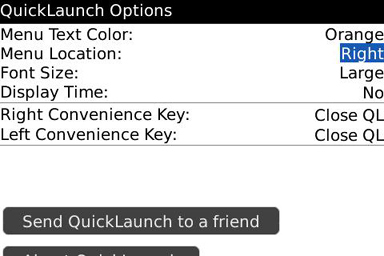 QuickLaunch is available from the CrackBerry App Store for $4.99, but unfortunately there isn't a free trial available. For more information, and to pick up a copy of QuickLaunch, click here.